If there's any sub-genre of horror that needs to be buried, it's the zombie film. Thanks to SHAUN OF THE DEAD (which is great), the walking dead have become a major source of amusement for hipsters and other folks who aren't really that interested in horror, but want to tell others they are. In the decade that's followed this resurgence, we've been subjected to every possible take on the genre, and most of them range from the dull to the unwatchable. Now enters "the shoegazing" zombie flick -- THE BATTERY. Ben (writer/director Jeremy Gardner) and Mickey (Adam Cronheim) are a pair of baseball players who manage to escape the carnage and chaos of a zombie epidemic by fleeing to the forests of New England. Ben thrives in the apocalyptic landscape, and seems to enjoy the nomadic, scavenger lifestyle. Mickey longs for the days when he could live in a house and sleep in an actual bed. Together this odd couple spends their time walking from abandoned house to abandoned house, foraging for supplies, playing catch, fishing, talking, and commandeering the occasional car. When they find a set of walkie talkies, they discover they aren't the only survivors. Mickey becomes infatuated with the female voice on the air, which leads to a whole new set of problems for the two wandering ball players. A lot of reviewers hate THE BATTERY because it doesn't follow the typical zombie movie stalk them, kill them, eat them template. In fact, the zombie outbreak feels incidental to the story at times. This departure is what makes the film more interesting than any hundred straight-to-video zombie flick. This is more of a 1970's-style character study of two men with opposite personalities who wait out the apocalypse together. We spend most of the running time watching them try to pass the time, breaking up the extreme boredom sure to accompany the end of the world with diversions -- small talk, playing baseball, and a lot of quiet reflection. Despite the fact that very little happens to advance the story, THE BATTERY is never boring. Quite an impressive feat for a film that's 75 percent two-men-doing-not-much-at-all. If there's any criticism here, it's that the film runs a little too long and meanders a bit in the middle act. In two weeks and for six grand, Jeremy Gardener made a very different kind of zombie movie that's more interesting and engaging than any other film of this sort in recent memory. If you're wanting for gory action, look elsewhere. 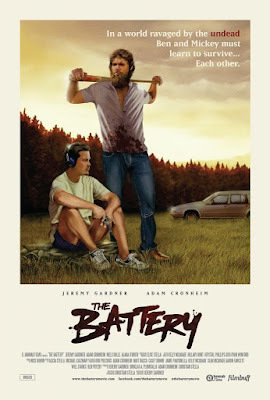 THE BATTERY is not a movie about special effects and violent gags, it's about people.